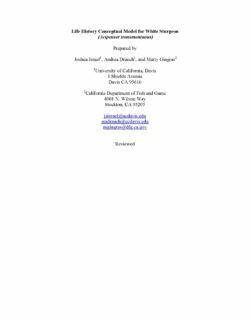 The purpose of this report is to develop a conceptual life history model of white sturgeon (Acipenser transmontanus) and the factors that affect reproduction, growth, and survival in the Sacramento-San Joaquin Rivers and San Francisco bay-delta. This model can be used to organize, visualize, and evaluate how the complex life history of white sturgeon relates to the spatial and temporal variability of riverine and estuarine ecosystems and potential consequences of ecosystem restoration and water management alternatives. 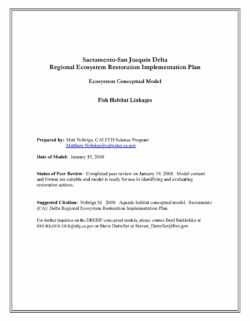 This model is compatible with the suite of environmental and species models developed by the Department of Fish and Game Ecosystem Restoration Program (ERP) to assess and prioritize proposed restoration actions for the delta. 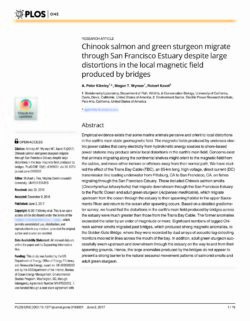 The model has a geographic emphasis on the Sacramento River and bay-delta regions, though the entire distribution of white sturgeon should be considered when population level responses are of concern, due to the migratory life history of this species. The conceptual life history model incorporates information from numerous sources about white sturgeon, often relying upon life history information from populations outside California. While additional surrogate information from other North American sturgeons could have been used in the model, the distinctive diadromous and ecological characteristics of California white sturgeon limited the utility of these species’ information, thus information from other diadromous sturgeon species is only occasionally considered. Due to the limits of quantitative information about white sturgeon, this model is presented in a qualitative narrative, though numerical information is provided when available. While it will not provide quantitative limits on species take relative to maintaining a stable population size, it could be further developed into a population forecasting model since it divides the life history into life history stages, transition probabilities, and factors whose effects on reproduction and survival could be quantified. Life history stage transitions are visualized in a series of life stage submodels highlighting the processes and relationships among ecological factors influencing the transition between stages (Figures 1 and 2). A complex set of conditions and processes are necessary to determine whether an individual white sturgeon completes the transition from one life stage to the next. Our knowledge of how biotic and abiotic factors are critical for maintaining healthy populations is fairly basic. Thus, the importance, predictability, and understanding of each of these linkages are identified in the model. Lastly, a similar characterization of independent stressors is undertaken to describe potential factors affecting survival during each life history stage in a known geographic region. This model is dynamic and not intended to be a final version. As new data become available, the model should be refined so managers and biologists have the most current information available. 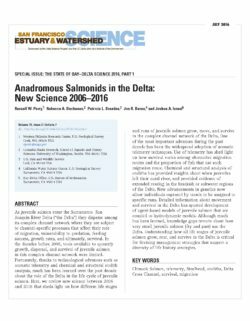 • (4) changes in source water distribution: preliminary model results suggest San Joaquin source water “signal” has been severely truncated, while Sacramento “signal” has been widely diffused, which could contribute to a decrease in the ability of migratory organisms (especially adult salmon) to navigate the Delta using source-water specific chemical cues (though improved model calibration in the upper reaches of the estuary is needed to draw firm conclusions). 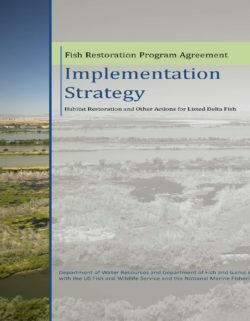 The Fish Restoration Program Agreement (FRPA) (Appendix A), between the Department of Fish and Game (DFG) and the Department of Water Resources (DWR), was signed on October 18, 2010. 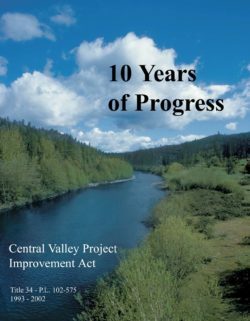 FRPA addresses specific habitat restoration requirements of the US Fish and Wildlife Service (USFWS) and National Marine Fisheries Service (NMFS) biological opinions (Biological Opinions) for State Water Project (SWP) and Central Valley Project (CVP) operations. 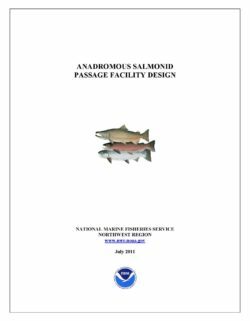 FRPA is also intended to address the habitat requirements of the DFG Longfin Smelt Incidental Take Permit (ITP) for SWP Delta operations. 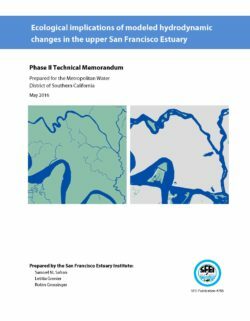 The primary objective of the FRPA program is to implement the fish habitat restoration requirements and related actions of the Biological Opinions and the ITP in the Delta, Suisun Marsh, and Yolo Bypass and is focused on 8,000 acres of intertidal and associated subtidal habitat to benefit delta smelt, including 800 acres of mesohaline habitat to benefit longfin smelt, and a number of related actions for salmonids. DFG and DWR intend that habitat restoration actions implemented in compliance with the USFWS biological opinion that also meet the habitat restoration requirements of the ITP will operate to satisfy the acreage requirements of the ITP. 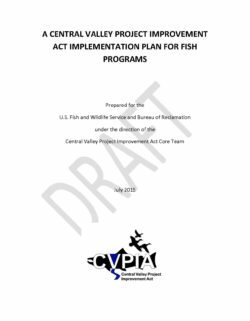 The purpose of this Implementation Strategy is to describe the process by which DWR and DFG will implement the FRPA program, and to satisfy Section B of FRPA. 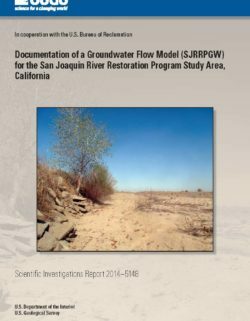 Section B of FRPA requires DWR, with assistance from DFG, to develop an Implementation Schedule that will identify restoration actions, estimated costs, targeted acreage, and a timeline for DWR’s implementation of restoration actions to satisfy DWR’s obligations under the Biological Opinions and ITP. Appendix B lists the specific habitat restoration requirements of FRPA, the Biological Opinions, and the ITP that pertain to this program. This document lays out the strategy to address these requirements. In addition, DWR and DFG will complete the necessary environmental compliance documents to implement site specific habitat restoration projects; this may include tiering from existing programmatic documents where appropriate. Pursuant to FRPA, DFG will work cooperatively with and assist DWR in establishing the management and financial framework necessary to implement the FRPA program. DWR, with assistance from DFG, will begin a process to fund, plan, and implement actions, including aquatic habitat restoration to benefit delta smelt, longfin smelt, and winter-run and spring-run Chinook salmon (hereafter referred to as Covered Fish Species) to mitigate impacts to these species caused by the SWP Delta operations. DWR’s obligations focus on delta smelt, longfin smelt, and winter-run and spring-run salmon, and may also benefit steelhead, sturgeon, and other native fish species.